Caudalie Vinosource SOS Thirst Quenching Serum is a high potency serum that captures and continually diffuses water deep within the skin to restore its moisture balance and leave it feeling soft and supple. Simply apply Caudalie Vinosource SOS Thirst Quenching Serum morning and evening to face and neck. Caudalie Vinosource SOS Thirst Quenching Serum can be used as an S.O.S treatment or all year round before your usual cream. 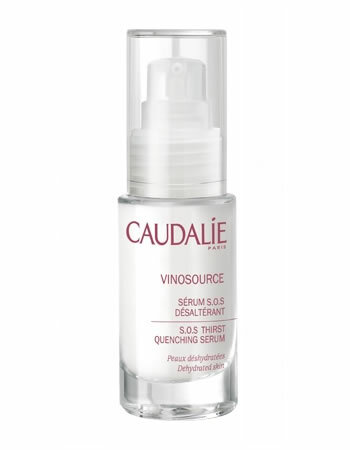 In tests Caudalie Vinosource SOS Thirst Quenching Serum increased hydration by 127% and skin sensitivity decreased by 61%.